Recently I was checking out my local farmer’s market and saw a young man sitting in front of a card table, with a big cooler behind him but nothing that I could see indicating what he was doing there. Curious, I approached, and it turned out that he was from Polk’s Folly, selling pork from a few pasture-raised heritage pigs being grown on his family land. And yes, he had some pork belly to sell. I scored a three pound chunk. At the time I planned to make it into bacon, and so I put it in a brine of one cup salt to one gallon of water and stuck it in the refrigerator. But a couple of days later I found myself daydreaming about it and decided to cook it for dinner. I put eight bay leaves and 3 cloves’ worth of sliced garlic on the meat side, rolled it up with the skin side out and tied it with kitchen twine, put it in a cazuela with half a cup of good white wine, and roasted at 350 until done through (160 if you tend toward exact measurements,) turning up the heat to 500 right at the end to brown the skin a bit. 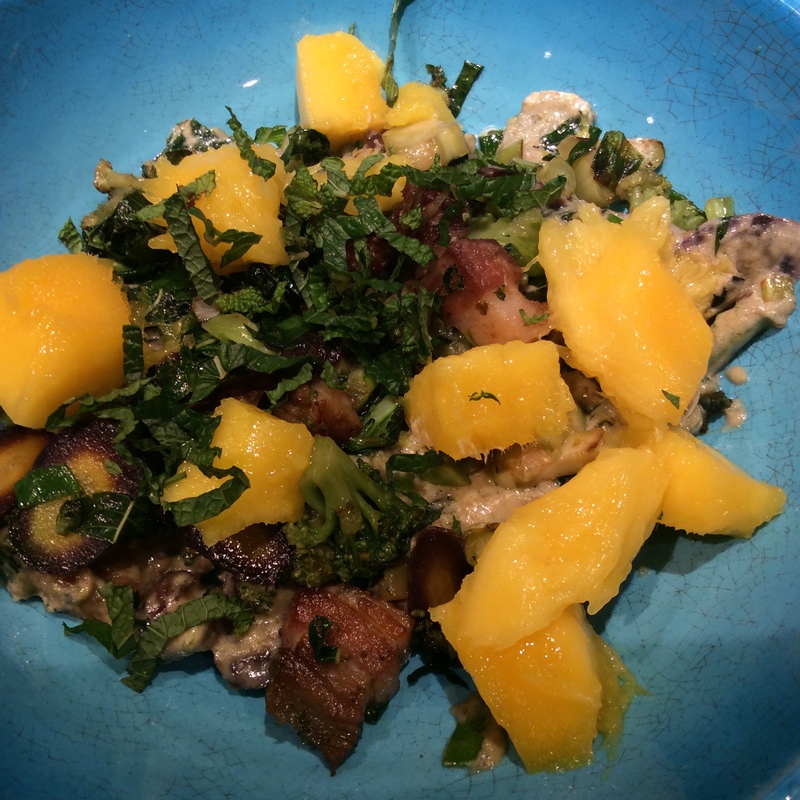 Thin slices were served with oyster mushrooms sautéed in butter and adorned with the garlic slices from inside the belly, and skimmed pan juices were poured around liberally. It was a delicious meal with a good cabernet but, for two people, just the beginning of three pounds of belly. A few nights later I hauled out the belly, cut two slices about a half inch thick, and cut the strips into chunks that ended up about 1/2″ square by 1″ long. I chopped up two big cloves of garlic and a 1″ piece of ginger. A huge scallion out of the garden was cut in 1/8″ slices, white and green kept separate. I got out gochujang, soy sauce, and artificial sweetener to equal two teaspoons of sugar (of course you can use 2 teaspoons sugar if preferred.) I microwaved some cauliflower rice. The belly chunks were sautéed over medium-high heat in a wok until they were beginning to brown nicely in their own fat. Then the scallion whites were added and stir-fried for about two minutes. Next the scallion greens and the chopped garlic and ginger were added and given one further minute of stir-frying. Then a rounded tablespoon gochujang and a good squirt of of soy sauce, along with two teaspoons of sugar or the equivalent in artificial sweetener. Boil hard until the sauce comes together and glistens, less than a minute if you were using high enough heat. Serve over the cauli rice. Add some pickled veggies if you like. 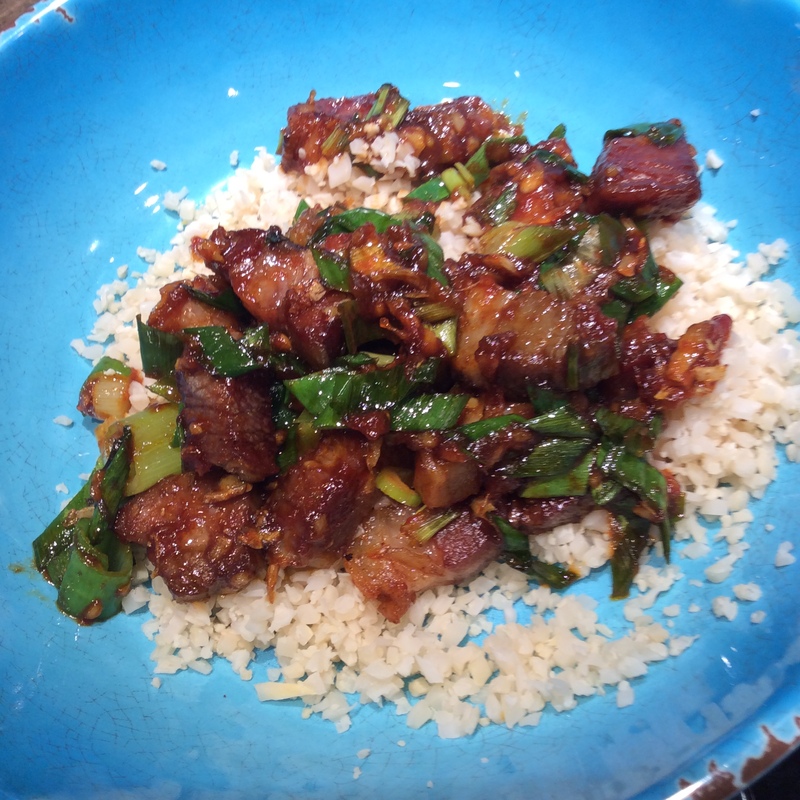 The third meal moves into Southeast Asia, one of the many parts of the world where the succulent pork belly is appreciated. One of the great treats of summer is an occasional perfect mango, and I had one ready on the counter. I was planning a Thai-style curry based on the superb Hand brand green curry paste, but ultimately decided that I wanted more veggies and less sauce. Using the inspiration of Six Seasons, I decided to make something that was a hot salad rather than a curry per se. Besides the leftover belly, mango, and the curry paste, ingredients were two large scallions sliced, a cup of pure coconut cream, some fish sauce and sweetener, and a wide assortment of veggies from my garden and freezer but just a handful of each, i.e. four Tuscan kale leaves slivered finely, about a third of a head of broccoli (with its peeled stem) blanched a few minutes and chopped, two small purple carrots, and a handful of chopped mint for the final garnish. This is a great place to use up any plainly cooked veggies that may be tucked into your refrigerator awaiting a purpose. To make the “dressing,” boil the coconut cream in a small sauce pan for a few minutes, stir in about a tablespoon of curry paste or more according to taste and boil a minute more, and add fish sauce and chosen sweetener to taste, make in the mixture a bit on the salty sweet side because there is a large volume of veggies fruit to season. Then set the pan aside while you finish the main ingredients. Cut two half-inch slices off the belly and cut into lardons. 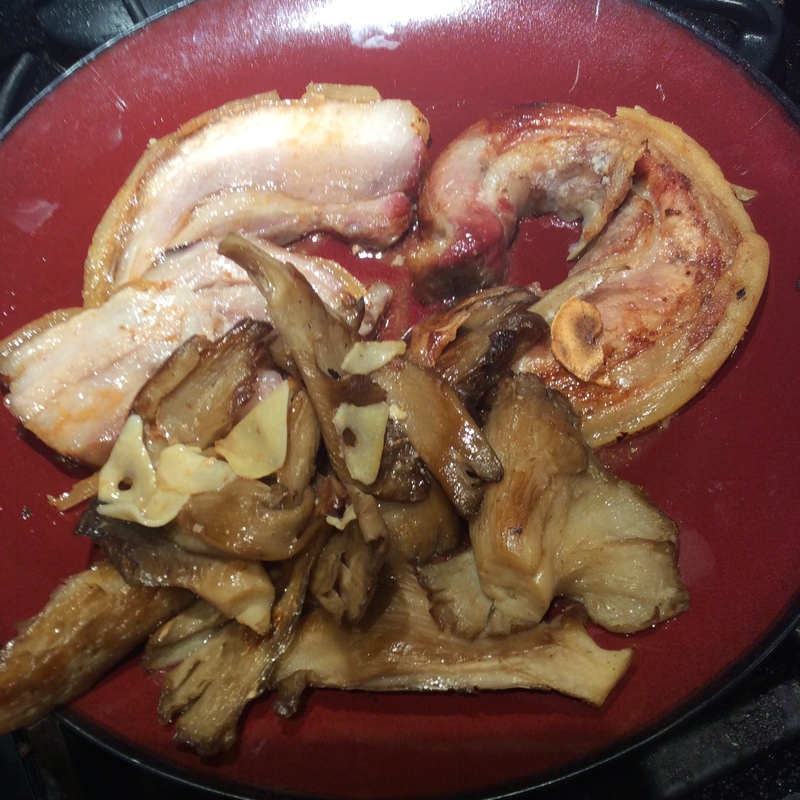 Put in a skillet over medium-high heat to b own and render some fat, turning frequently. Meanwhile sort the veggies into fast-cooking and slower-cooking, putting the scallion greens in the first pile and the scallion whites in the second. When the belly chunks are browned, add in the slower-cooking veggies and stir fry until crisp-tender, add the quick-cooking veggies, and cook until thoroughly heated through. Put in a little fish sauce with the veggies but not too much, since the belly is already salted. Now toss half the hot veggies in the saucepan with the curry sauce, plate them on two plates, put the unsauced belly and veggies on top for an unmuddied appearance, slice the peeled mango over the composition, and top with the chopped mint. Dip down into the “dressed” part of the meal with each bite. Have some Thai sriracha available for drizzling if you like. 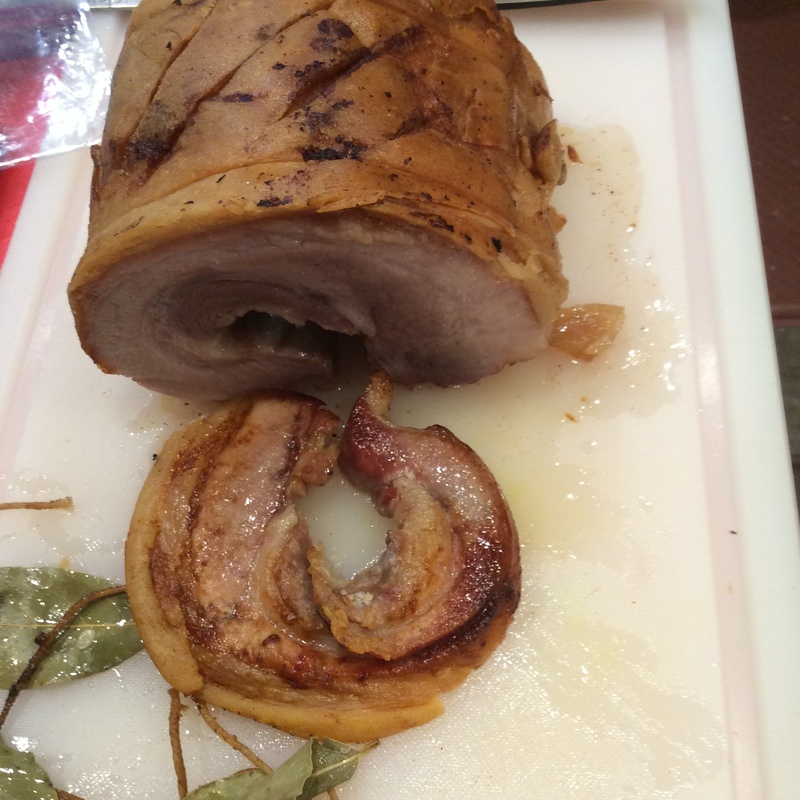 By the fourth meal, there was one strip of belly roast about 3/4″ thick still left. I decided on a Thai meat salad. Since we were quite hungry I decided to add two Thai-style fried eggs to each plate. 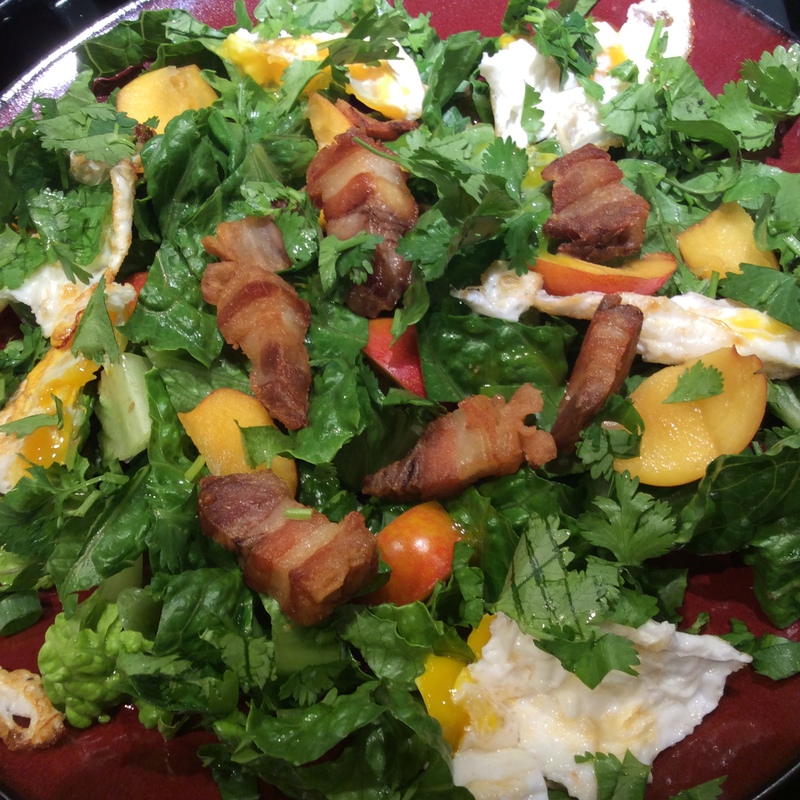 In addition to the belly strip and four eggs, I used a small head of Romaine lettuce, one large scallion, a generous handful of coriander leaves, and two partially ripe plums. If you are using plums from the grocery store, it’s pretty easy. Almost any two will do and will still be somewhat green, firm, and not too sweet. Or use cherry tomatoes if you prefer. First have an appropriate dressing ready. 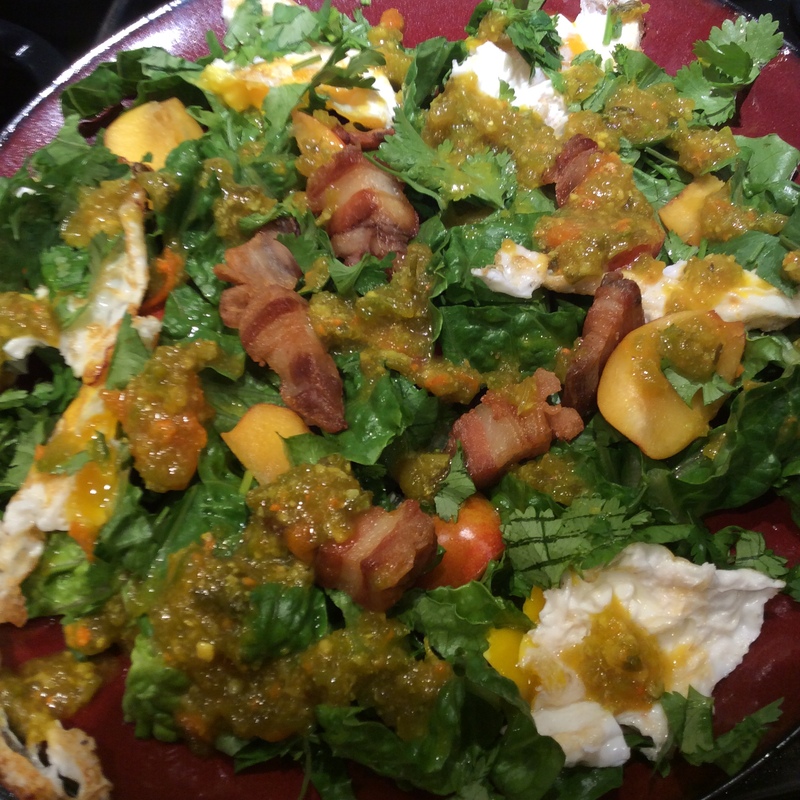 Mine was a rather elaborate concoction based on some pickled kumquat rind that I made a month ago and ground coriander stems, but you can use the simple spicy-sweet dressing described at the bottom of the page. 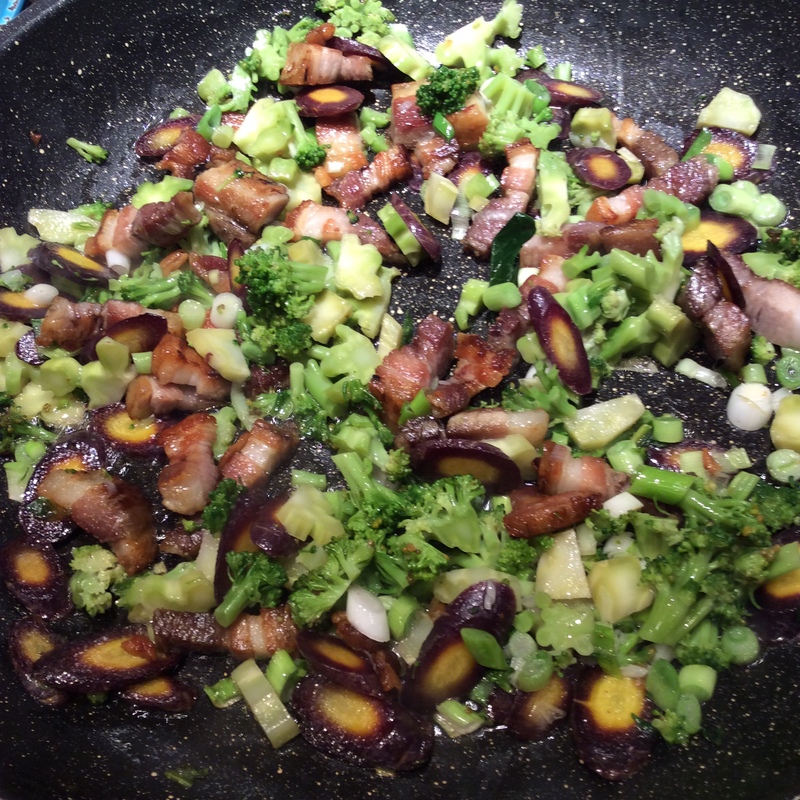 Cut the belly strip into lardons and fry them in a hot skillet with a spoonful of coconut oil until browned. Remove and drain on paper towels. Add a little more coconut oil to the pan and fry the eggs over medium-high heat, turning them a few times and salting on both sides, until they are cooked through and browned around the edges. Remove and drain. Slice the romaine into strips about 1/2″ wide. Cut the plums in slices. Slice the scallion fine and chop the coriander leaves. Plate the lettuce, cut the eggs in thirds or quarters and arrange around the edge, and put the crisp lardons in the middle. Decorate with the plum slices and scatter the scallions and coriander on top. Dress with the dressing and eat. If you had everything on hand, total elapsed time is about 15 minutes. If you have read Tamar Adler’s marvelous book An Everlasting Meal, you know all about main dishes that keep on giving. If you haven’t read it, please do so immediately. Frugality in the kitchen is a common thought for most of us and you may already cook that way, but Ms. Adler will show you the poetry and grace of it. Cooking is in some ways a ghostly process anyway, with our great-great-grandmother’s transparent hand guiding our own, and we are further informed by the ghost of each meal contributing to the next. Hot-sweet Thai Dressing: this doubles as a dipping sauce and is very handy to have in the refrigerator. Finely chop four cloves of garlic and a piece of ginger about an inch long. Thinly slice a couple of Serrano or Jalapeño chiles, removing the seeds and ribs unless you’re a real heat freak. Mix the chopped and sliced stuff with half a cup of fish sauce, a quarter cup of rice vinegar, a quarter cup of water, and two tablespoons of palm sugar or the equivalent in artificial sweetener. Let sit fifteen minutes and taste cautiously. Adjust the various elements until it tastes well-balanced to you. Wow, you are quite the chef!!!! Sounds and looks delicious! Actually I’m not, and most of my cooking is simple and improvisational and stems from thoughts of what leftovers need to be gotten out of the refrigerator😉. Thanks for stopping by.